I always write letters to the girls at significant milestones like birthdays. The birthdays are flying by now at a rapid pace, but still, the years in between those dates stretch out into many moments that I want to savor and remember. And sometimes a letter forms in my head during these moments and I think about what I would say to her right then if she were listening, and what I would say to her grown-self as I imagine her thinking back to the days of her littleness. How much of it all is remembered, and what filters will slip into place over these memories? What will retain significance, what will grow in meaning, and what treasures will slip away on a gentle wave, out to sea, never to return? I suppose my letters take some of those treasures and apply them to paper, coil them up in a tight cylinder and slide them into a glass green bottle. I have no idea if they will ever be read again – will I be around long enough to pull them back out of the surf? Will she? No matter. They are still there and they will be what they need to be as she grows, and I grow and time passes too quickly for my liking. Too, too quickly. 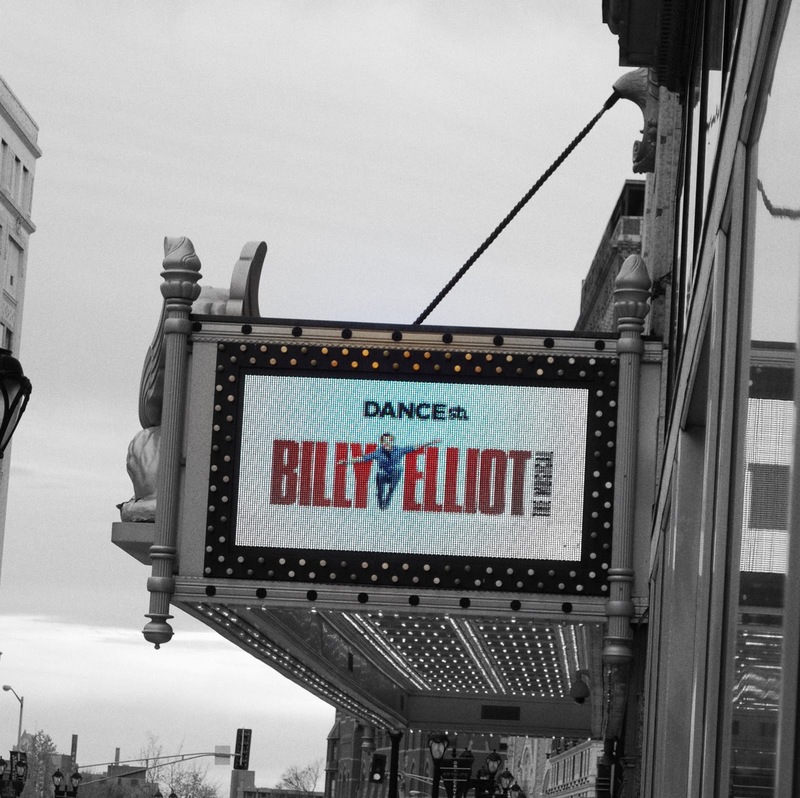 On Saturday afternoon E and I went to see Billy Elliot at the Fox. We do things together all the time, but there is still something so rare and special about attending an event like this with each other that I love. It’s like the rare date with your husband without all the babysitting arranging and hoopla involved in getting out the door for a bit of escape. It felt so good to stay in pajamas until noon, and then clean up after lunch and do just that – escape. I watched the corner of her face in the rearview mirror, watched her gazing out the window while she talked. I followed her eyes just as I was following the road, trying to see what she sees, what she notices, what she takes in. She poured out of the backseat, miles and miles of lanky legs that grow each day, and she slipped her hand in mine without a bit of hesitation. This age is magical. You can catch glimpses of a teenager and a woman and a school girl and a toddler in her face, and you blame it on the lighting because if you acknowledge that it’s more than that then your heart squeezes too tightly in your chest and you have to check the corners of your eyes for dampness. She will catch you in those moments, and call you out on them. She will turn to you in the darkness of the theatre and see the tears on your cheeks as Billy reads a letter from his dead mother and she will smile that knowing smile because she is smart and observant and she know your buttons better than you know them yourself. I am the letter writer in the family, although M can write a good one, and won my heart that very way. At the beginning of the school year E wrote a letter to us outlining her goals for herself for the school year. We were asked by her teacher to write our own letter back to her. It was one of those tasks that gets filed away on the to-do list, and because it does not exist as a handout or form or invoice it never surfaces to the top of the pile. After a friendly reminder or two, M sat down to write it himself while I sat through a long and difficult meeting somewhere else. When I came home exhausted and drained with my head pounding and swimming at the same time, he handed me the letter and invited my input as well. I took a deep breath, shifted my focus, and read. We are proud of the work you are doing in school and have a few goals for you this year. First, we would like to see you continue to improve your hand writing skills by practicing your careful and neat writing. You have very creative story ideas and we would like to see you get them on the page without being frustrated by spelling, crowding, and messy writing. We know you have been interested in cursive for a long time, so maybe you’ll get a chance to start learning that! One of our favorite things about you is your creativity with art projects. Our goal is for you to continue to be open minded about trying new things and not getting frustrated if they don’t turn out exactly as you planned. We would like you to remember that art is an experiment and may take more than one try to get the results you want – especially if it is the first time you are trying a certain project. We really enjoy helping you with your math homework and watching you learn about numbers. We hope you find new and creative ways to use numbers, and get a better understanding of how numbers relate to each other. We also hope that you notice how your school uses math in some pretty cool ways outside of “math class” (like menu planning for culinary arts and budget planning for your field trips, just to mention a few). Finally, we love seeing you perform. Whether it is out on the soccer field, in a violin concert, or standing in front of a group presenting your ideas. We would like to see you continue to be brave, speak with confidence and have fun with everything you do. P.S. We forgot to say anything about reading! You are an incredible reader. Our goal is more for us than for you – we want to make sure we always have a new and interesting book for you on your bookshelf or nightstand, even when you read it all in one night! What a gorgeous letter, I had nothing to add. I can see all the lovely things in my mind that I wish for her. I can lace my fingers through hers and tip my forehead to hers and lose myself in a play, all the while wanting a promise that I will always be allowed to lace my fingers in hers, that it will always be that way. I can marvel in the discussions we are able to have post-play about language and innuendo beyond her years, and know that she is growing up into a person that can be exposed to a variety of viewpoints and still maintain who she is. But I cannot place all of that expectation, and the weight of all of those dreams on her eight-year-old shoulders. I can wish for her happy cursive writing and creative math problems, always take the time to stop into a good bookstore, and celebrate her triumphs on the small stages she chooses to climb on. The rest is a love letter to myself, to let her be, to savor these moments, to touch foreheads with her whenever I get the chance but to release those fingers when I need to, when she needs me to.